In my quest to quit sugar, I’m trying a lot of new recipes. Mostly from Sarah Wilson’s “I Quit Sugar” book, but also from the Internet… And the dark, dusty corners of my own imagination. 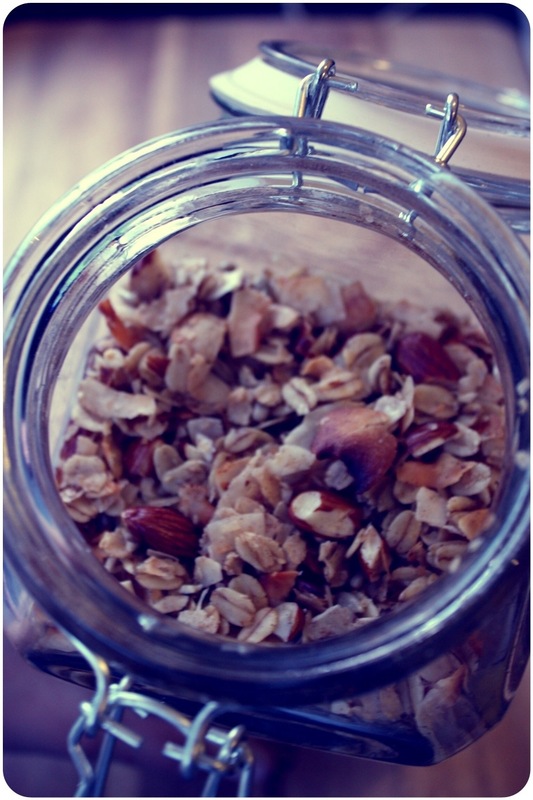 This granola is from Sarah’s cookbook, but also published on her blog here. I’ve dabbled with the recipe a bit over the half-dozen times I’ve made it – mostly out of necessity, because my supermarket doesn’t stock half the recommended ingredients. That, and I really love oats. Because you only add the ingredients you like (and leave out the bits you don’t), you’re almost guaranteed to love it. And – ignoring my oats – the recipe’s pretty much Paleo. This granola is so easy to make – it seems like it’s impossible to stuff it up. Honestly. I set fire to the baking paper which lined my tray and everything still turned out tasty and delicious. Not burnt at all! Bonus: the cinnamon makes the whole house smell good enough to eat. 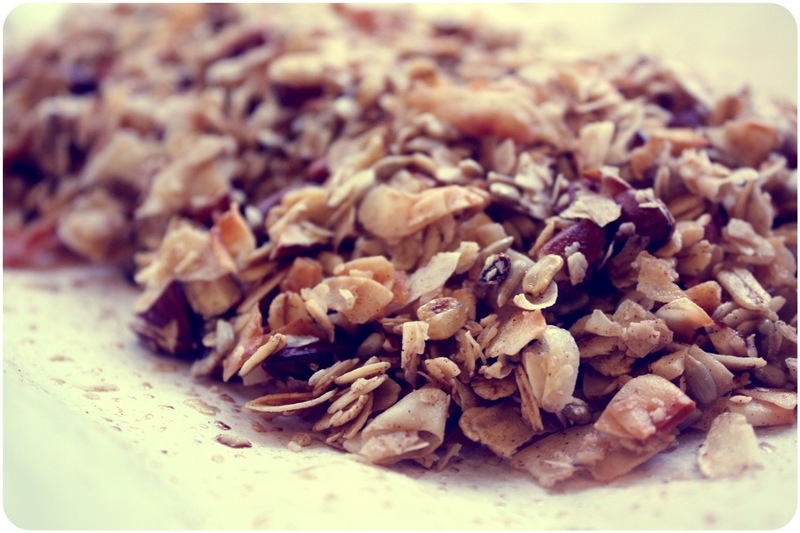 With thick, natural yogurt, this granola is gorgeous. So crunchy. So filling. So good. I prefer it a little sweeter most mornings and opt for eating it with full-fat milk instead. Both are good and completely change the profile of the meal! It’s portable, so you can easily eat it at work (like I did with my store brought cereals previously). Breakfast has been the hardest meal to adjust with (No boxed cereals! No toast! No fruit!) so having something so sugary-muesli/cereal-like, and filling, has been a great help. Plus: keeping it in a nice glass container makes it feel extra special! Adds to the morning ritual of breakfast and a coffee to get the day off to a good start. 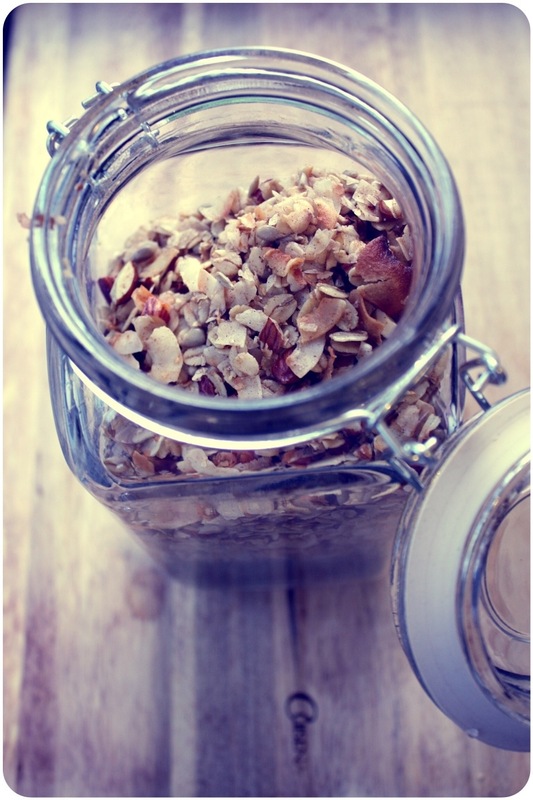 Do you have a granola / muesli recipe you swear by? Or have you found a company that makes it just the way you like it so you stick with store-bought? going to definitely give this a try… looking for a few new breakfast ideas. This looks like a great one! No toast? No boxed cereals? No fruit? Ah! Crazy stuff. Glad you were able to find something you enjoy eating for breakfast. How much do you think it costs to make up a batch? Costs me about roughly NZ$8-$10 for a batch, but that depends on the oats-coconut-nuts ratio. A batch probably lasts for 10ish serves of a handful each (you don’t need a lot – it’s very filling). More expensive than a lot of options, but cheaper than a lot of the paleo cereals, etc, on the market. Granola is my go to breakfast. i started making my own a while ago, mostly to cut down on additives and this http://www.fatgirlslimblog.co.uk/?p=6277 is my first recipe. I do use honey in mine but with only 3 to 4 tablespoons in a batch that lasts me two weeks it is still low in sugar. Mostly I just make it up as I go along and throw in what in have to hand on top of the basic oat, seed, honey base.